African Flora as Potential Sources of Medicinal Plants: Towards the Chemotherapy of Major Parasitic and Other Infectious Diseases- A Review. Sodium Azide Induced Complementary Effect of Chromosomal Stickiness in Brassica campestris L.
Total Phenol, Antioxidant and Cytotoxic Properties of Wild Macrofungi Collected from Akure Southwest Nigeria. Isolation, Characterization and Determination of Antimicrobial Properties of Lactic Acid Bacteria from Human Milk. Challenges Towards Hypericum sinaicum Conservation in South Sinai, Egypt. An Initial In vitro Investigation into the Potential Therapeutic Use of Lucilia sericata Maggot to Control Superficial Fungal Infections. Trehalose Accumulation in Wheat Plant Promotes Sucrose and Starch Biosynthesis. 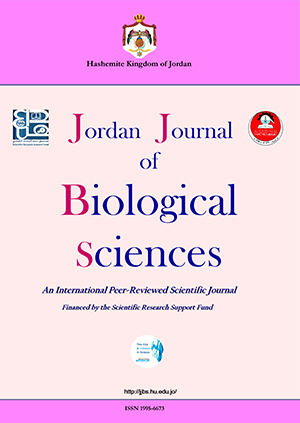 Response of Three Accessions of Jordanian Aegilops crassa Boiss. and Durum Wheat to Controlled Drought. Effects of Cigarette Smoking on Some Immunological and Hematological Parameters in Male Smokers in Erbil City. 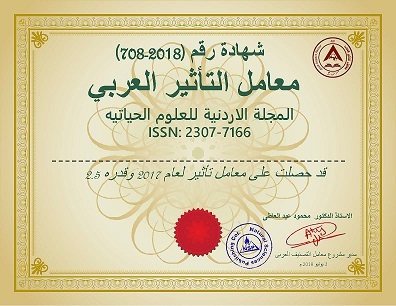 Knowledge of the Use and Benefits of Applying Biotechnology and Cell Based Therapy in Orthopaedics in Jordan: Questionnaire Survey and Regulation Assessment. In vivo Assay for Antagonistic Potential of Fungal Isolates against Faba bean (Vicia faba L.) Chocolate Spot (Botrytis fabae Sard.). "Vinegar" as Anti-bacterial Biofilm formed by Streptococcus pyogenes Isolated from Recurrent Tonsillitis Patients, in vitro. Effects of COX-1 and COX-2 Inhibitors in L- Nitro-L-Arginine Methyl Ester Induced Hypertensive Rats. Is Gaza Sandy Shoreline Region Contaminated with Human Gastrointestinal Parasites? In vitro Screening of Lactobacillus species from Homemade Yoghurt for Antagonistic Effects against Common Bacterial Pathogens. Bioefficacy of Azadirachtinin Controlling Culex pipiens pipiens (Diptera: Culicidae). Micro and Macronutrient Properties of Pleurotus ostreatus (Jacq: Fries) Cultivated on Different Wood Substrates. Effect of Ethanol Extract of Calotropis procera Root Bark on Carbon Tetrachloride-Induced Hepato-nephrotoxicity in Female Rats. Ameliorative Effect of the Aqueous Extract of Zingiber officinale on the Cadmium-Induced Liver and Kidney Injury in Females Rats. Bionanotechnology: The Novel Nanoparticles Based Approach for Disease Therapy. Levels of Chromium and Copper in Liver and Muscle Tissues of the Round Sardinella Sardinella aurita (Valenciennes) from the Oran Coastline, Algeria. Evaluation of Antioxidant Properties of Morus nigra L. Fruit Extracts [II]. Antimicrobial Activity of Xerophytic Plant (Cotula cinerea Delile) Extracts Against Some Pathogenic Bacteria and Fungi. Correlation Between Numerical Profiles Generated for Soil Spore Forming Bacilli and Their Inhibitory Potential Against Staphylococcus aureus ATCC 6538. Protective Effects of Enantia chlorantha Stem Bark Extracts on Acetaminophen Induced Liver Damage in Rats. Odonata of Wadi Al Mujib Catchment with Notes on the Impact of Wadi Al Mujib Dam, Jordan (Insecta: Odonata). Comparative Studies on Anti-hyperglycemic Effects of Ethyl Acetate and Methanol Extract of Albizzia lucida Benth Bark in Alloxan Induced Diabetic Rats. Effects of Theileria lestoquardi Infection on Haematological and Biochemical Parameters in Experimentally Infected Desert Ewes. New Records of Arthropod Ectoparasites of Bats from North-Eastern Algeria. Prevalence of Lactose Intolerance in Primary School Children in Qena Governorate, Egypt.